« Plants vs. Zombies 2 Coming in 2013! 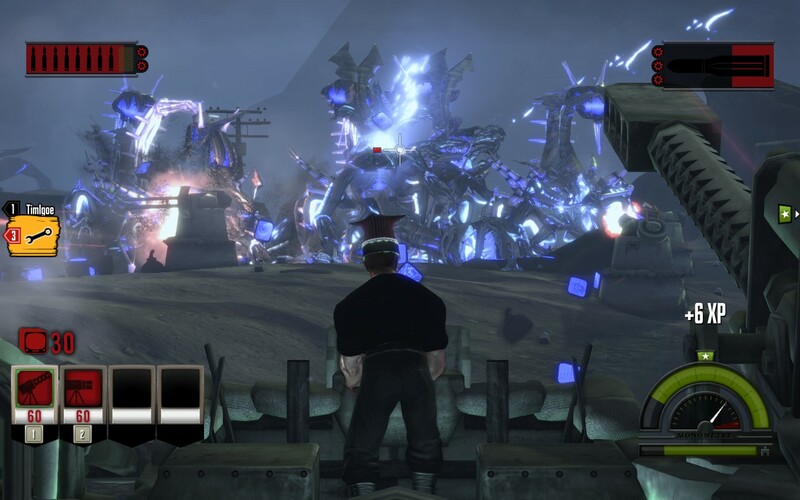 We recently acquired Iron Brigade, a World War I style tower defense-shooter hybrid with mechs and turrets, and a television-based enemy called the Monovision. I spotted this game a long time back, when it was known as Trenched, because of the developer Double Fine who came up with this game as well as Costume Quest and Stacking during one fortnight of development. A trademark dispute in Europe resulted in a name change, and a delay to the release: December last year on the Xbox, but only this month for the PC.. and another rather quiet release too. As part of the Mobile Trench Brigade, players control a ‘trench’: a walking mech designed for soldiers disabled in war, and now modified to carry weapons and turret emplacements! 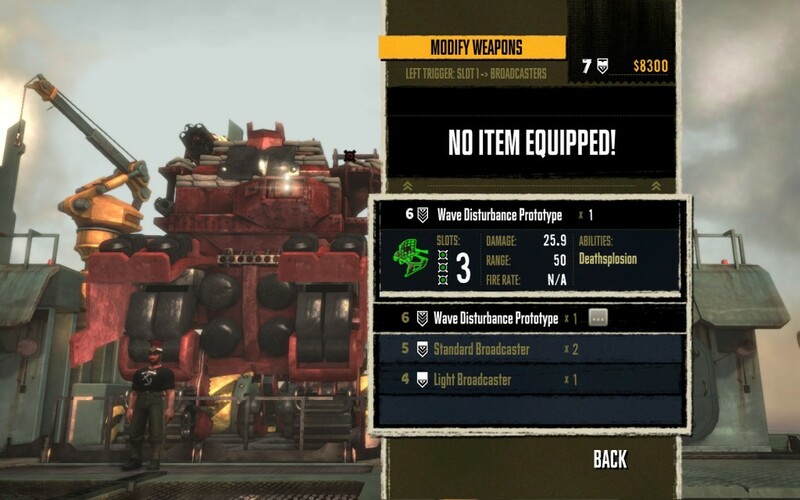 The trenches are customisable, with new parts earned during play or available in the shop; you can have a small mech able to call down a wide range of turrets, or a hulking machine equipped with massive cannons and mortars, or anything in between. The Mobile Trench Brigade is based on board the USS McKinley, under the command of war veteran Frank Woodruff; he is one of two survivors of the previous Broadcast which went around the world at the end of World War I, killing those who listened to it. 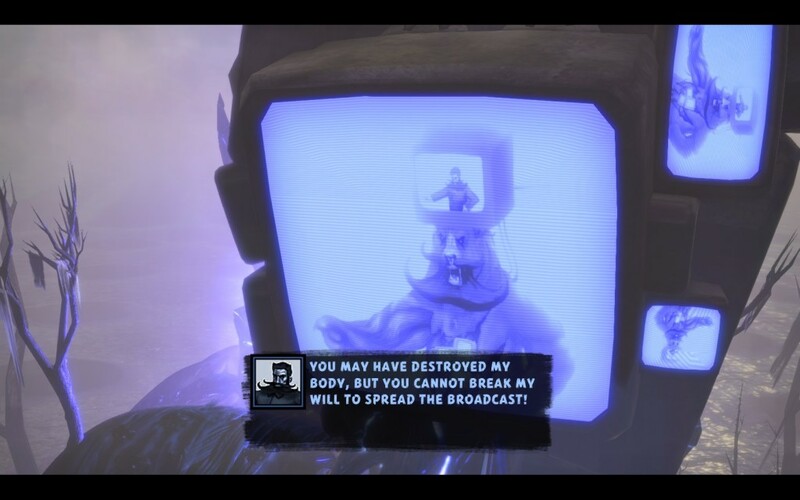 The other war vet in the story is the insane Vladimir Farmsworth; he created the Monovision, and is now trying to spread The Broadcast.. along with rather cheesy commentary on our progress and the new enemies he was sending along to defeat us! 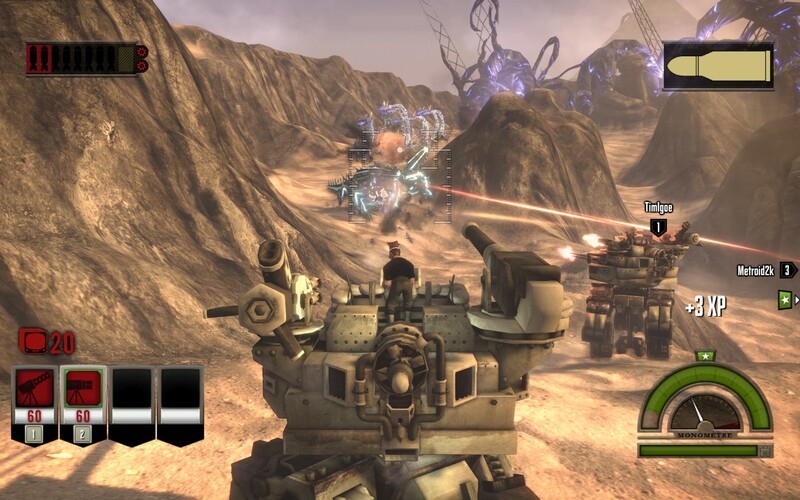 Scrap dropped by defeated enemies is shared equally between all players, and having three players meant a wider range of weapons and turrets could be brought along. There’s also a bonus to be had by playing with others, as all recent players are counted in your Regiment, with additional goals and rewards being met by experience gained by any of those players. 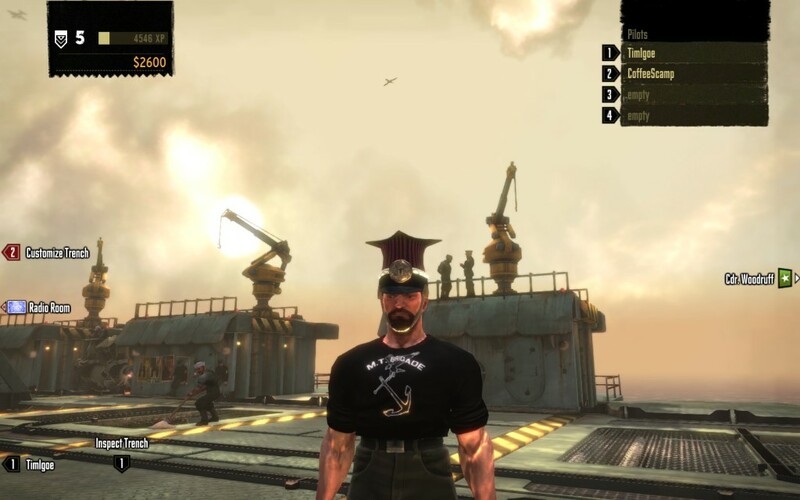 This meant we received a lot of unlocks.. new weapons, turrets and outfits for our characters, including hats! The early levels were easy to blast through, and I got myself a massive trench with huge weapons.. the downside being that I was limited to only two turrets. Having friends along meant other turrets were available though, including a repair turret which became almost essential on later levels when we were facing big enemies like the Berthas, and the trench-exploding Knob mines. The final mission had us take on Vladimir himself, in a massive brain-like machine. This fight took a while to get through, so we didn’t earn any bonus for beating the par time.. however, we can always replay the mission with better weapons and turrets, either earned or bought from the in-game shop. Despite appearing to be dead at the end of the last campaign, Vladimir escape and is now trying to spread the Broadcast from Mars. He’s also transferred his consciousness into his pet bear..
Mars looks to be a lot of fun, with a welcome increased difficulty.. but we’ve had to stop playing due to some horrific lag which appears part-way into the first mission. From what we’ve seen on various forums, it’s a known problem.. we’re going to wait for a patch rather than suffer! This entry was posted on Sunday, August 26th, 2012 at 12:34 pm by CoffeeScamp and is filed under Blog. You can follow any responses to this entry through the RSS 2.0 feed. You can leave a response, or trackback from your own site.